Welcome to our gallery featuring modern patio ideas. Emanating elegance, grace, luxury and sophistication, modern patios designs are pleasant and valuable additions to contemporary homes. Patios provide a comfortable way to enjoy outdoor living, allowing homeowners to enjoy personal time for relaxation or offering an opportunity to spend quality time friends and family. From an outdoor sanctuary where you can savor tranquility, or view decks where you can bask under the glorious stars at night – these are just some of the benefits a well designed patio can give you. Aside from boosting up the value of one’s home, it offers multiple purposes, serving as an extension of the home’s living and dining room spaces. The modern patio in the picture above extends the indoor living area to the side of the pool, giving more room to enjoy intimate gatherings with family and friends. Massive light colored ceramic tiles which are used both for the indoor and the outdoor spaces give this house a uniformed look and makes the area appear bigger. The seamless transition of the indoors to the outdoors produces a sleek surface which exudes modern elegance. Modern furniture mirrors the streamlined design of the ceiling and other architectural elements found in this outdoor living space. Also the light neutral color palette bring a clean, sleek and airy feel. 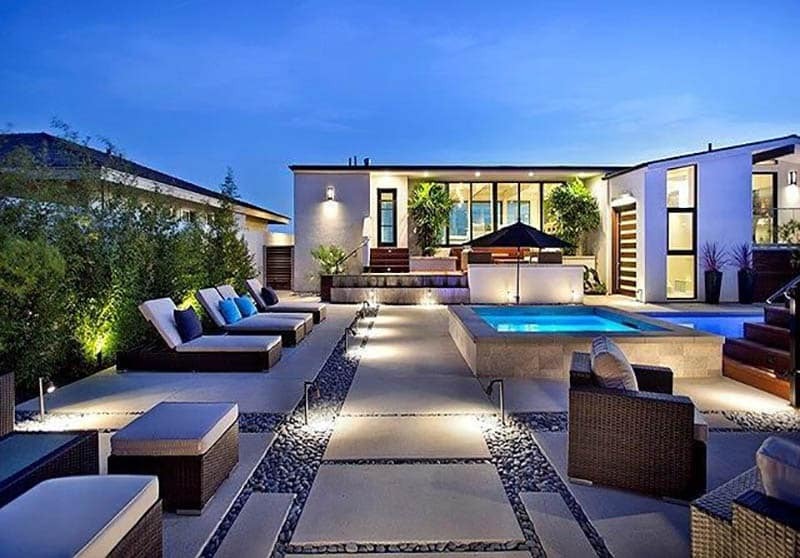 Overall, this modern patio exudes contemporary sophistication. If you are looking for an inspiration to transform your patio into a relaxing urban oasis, then you have come to the right place. Below we explore different modern patio ideas to help you build your very own personal outdoor sanctuary. 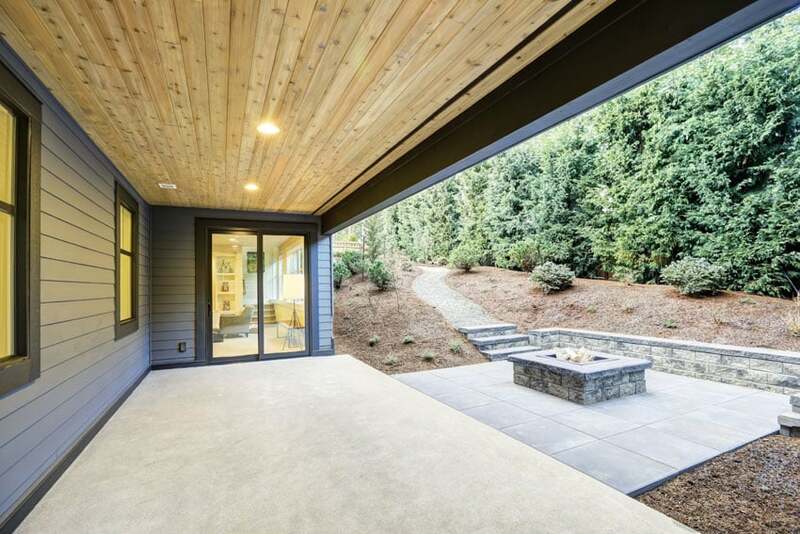 This modern patio gives a direct view of the main house’s indoor living area through the glass sliding doors. Its subdued color palette plays with cool and warm tones of gray, combined with clean beige hues and an accent of metallic silver. The clean lines of the three seater armed chairs and the square center table match the minimalist style of this outdoor living area. Decorative metal planters lend a strong accent without deviating from the formal color scheme of this modern patio. In this design, we also see how finely sculptured plants and foliage work as organic sculptures which instantly softens the rigid look of this space. A patio with an effective design does not only put aesthetics as its priority but it also considers function, comfort and convenience as well. The goal is to make this outdoor living space enjoyable and comfortable for you and your guests. Replicate the same feeling that you get from a day spent in the relaxing outdoors, whether it may be along the beach or a secluded mountain retreat. 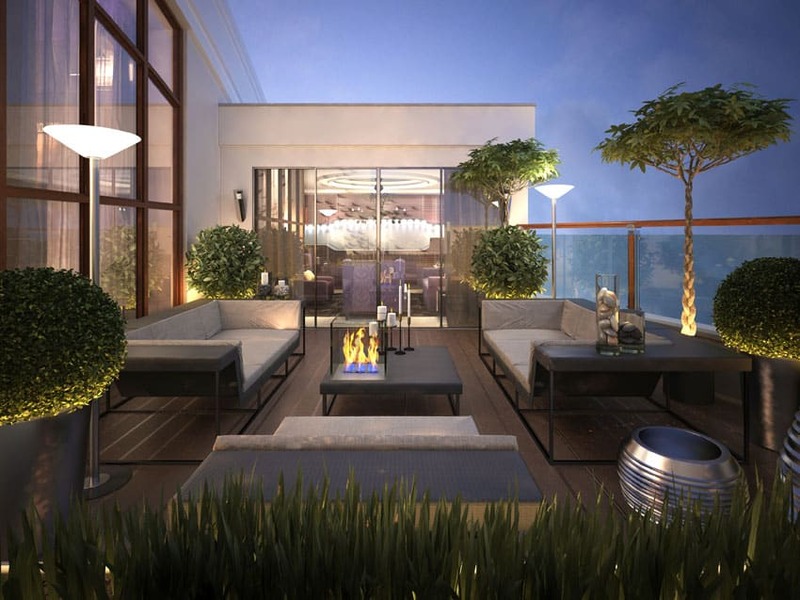 But how do you blend these factors with modern design sensibilities to create a stunning patio? We have come up with our very own “cheat sheet” for designing modern patios to help you take out that guesswork. We hope you get inspired as much as we did. Less is more. When it comes to modern design, less is always more. Modern patios go for a clean, refined and uncluttered look. Minimalism can be achieved by keeping things simple and basic. Also, keep embellishments to a minimum. If planning to go with a minimal amount of furniture,select a few functional pieces which can deliver a statement, like a single piece of sculpted concrete bench. Bring the indoors outdoor. Design your patio in a way that you would design the inside of your home – a cozy place where you can relax and unwind after a long tiring day at work. Think of it as an extension of your living room, dining room or kitchen. The way you furnish your patio is no different from the interiors of your home, except for the fact that the finishes should be more adaptable to exposure to weather changes. Add interior comforts, like a coffee table where you can put your favorite book and a cup of coffee, or a few accent pillows which you can cuddle while relaxing. Play with textures. Since modern patios usually stick with monochromatic or neutral palettes, there is a tendency for it to appear dull or too boring. However, a mixture of textures ensures that interest runs high in your design. Create variations in terms of furniture, furnishings, flooring materials and finishes. Learn to create contrast as it adds depth and dimension to the overall look of your patio. Combine a medley of soft and hard surfaces, smooth and rough finishes – like a textured concrete flooring with grass ground cover and gravel fillers. Polished surfaces like stainless steel outdoor kitchen counters, metal railings or high gloss ceramic tiles are also a basic component of the ultra modern patio design. Experiment with shapes. Modern design puts an emphasis on form and shapes. For minimalist styles, go with formal, streamlined surfaces, clean cut edges, straight angles and linear forms. For contemporary styles, you may try more organic shapes, like way patterns, semi circular forms or curved surfaces. You reflect this in your furniture pieces, your patio covering or your floor pattern layout. Introduce an accent color. Add drama to modern patio designs by using one or two accent colors which can create visual contrast to your space. This instantly livens up subdued color palettes. Accent colors doesn’t always need to be vivid, bright or shocking. If you do not want to commit to the intensity of fire red, lime green or Tuscan yellow, you can go for more muted tones like mustard or burgundy. Rich deep colors make eye catching contrasts too. For monochromatic color schemes, adjust the tone of your chosen hue into a darker shade – for example, charcoal gray throw pillows stand out in a cool gray arm chair. Go eclectic. The modern style doesn’t always have to be plain looking. Sometimes you can tweak things up a bit and produce a stunning design composition. Learn to mix and match to keep the overall look of your modern patio from being too monotonous. Combined rustic materials like a wood ceiling with refined surfaces like ceramic tile flooring. Also, there is a wide array of furniture choices which one can choose from. This may be a bit tricky to pull off as you have to know which type of surfaces do not clash with each other. Also, do not go overboard with your design. Delineate spaces by changing the flooring material. Define the different areas of your modern patio by changing the flooring material or using a different floor pattern layout. This is highly suitable if your yard area is expansive. It clearly separates the activities in your patio without having to construct partitions or use dividers. A change in the flooring material does not only add an interesting visual component to your design but it is also functional. For example, a grass lawn transitioning to an outdoor living area with a concrete flooring instantly breaks the stiffness of a hard surface. Separate your outdoor kitchen by using non slip stone tiles flooring and utilize concrete pavers for the walkways leading to your garden patio. Also, designate the appropriate type of flooring material for each area to avoid accidents, especially for patios near the pool. Add a water feature. The calming background noise of flowing water keeps the ambiance of your modern patio serene and tranquil. If you want a place of retreat reminding you of an oasis, then this is the right accessory for you. Water features also work well as a stunning focal point for patios. Take advantage of views. If your house is situated on a hillside, near the beach or on top of a building, take advantage of this breathtaking views for you and your guests to enjoy. Strategically place your patio in an area where you can get a full view of natural landscapes or urban settings, whether it may be the countryside, the city lights, or the turquoise blue water of the ocean. Also if your patio is exposed to a stunning picturesque view, allow your design to take a backseat to give room for the natural features to stand out. Do not obstruct these views by using railings which are transparent like glass or fiberglass panels. Design your patio as an all purpose retreat. A patio is a versatile outdoor living space where you can engage in both personal and group activities. Design it in a way where you can enjoy both. Nowadays, patios are becoming an integral part of the home because it is designed to accommodate more areas like the living area, dining area, lounging area, entertainment area and the outdoor kitchen. An expansive luxury patio is usually furnished with an outdoor kitchen and a large dining area where guests and family members can enjoy a sumptuous meal. A relaxation corner can be added to this by setting up a piece of lounge chair giving the user a quiet spot to read a book or enjoy a cup of coffee. In case of a limited space, maximize the area of your patio by using multipurpose furniture pieces, in that way you can still cater to a lot of activities without taking up much room. Create trends. Trend setting and dynamic thinking are essential in designing a modern patio because it allows you to create a space that is one of a kind. There is no limit to design and infusing your personality into your patio makes it more suited to your taste and personalized. This is also especially important in statement making. Use natural materials. Materials like wood and stone are well loved as patio finishing materials because of their natural beauty. They contribute an organic feel and a natural coziness to patios, making them more inviting. Rustic tones and rough textures coming from stone flooring and fireplaces add warmth to the overall look of a patio. Incorporate flowers and foliage. Plants and flowers are an integral part of patio design. They contribute variety in texture, shapes, size, colors and give contrast to different contours and finishes. They soften architectural components, introduce an organic feel and bring natural coziness to an outdoor living space. 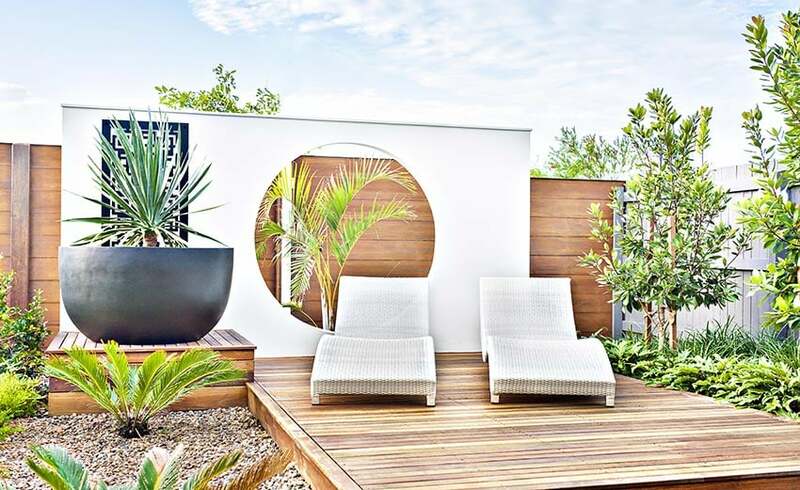 In designing a modern patio, go for finely sculpted foliage and opt for plant containers which have a clean defined profile and downplayed hues like gray, black or white. To cover or not to cover. Decide whether you want to put a structure over your modern patio. Aside from being functional, patio covers are also ornamental. They provide shade from the sun, keeps you dry in the event of rain and also adds a decorative component to your design. Patio covers can range anywhere from a trellis, to a pergola, canopy or a gazebo. 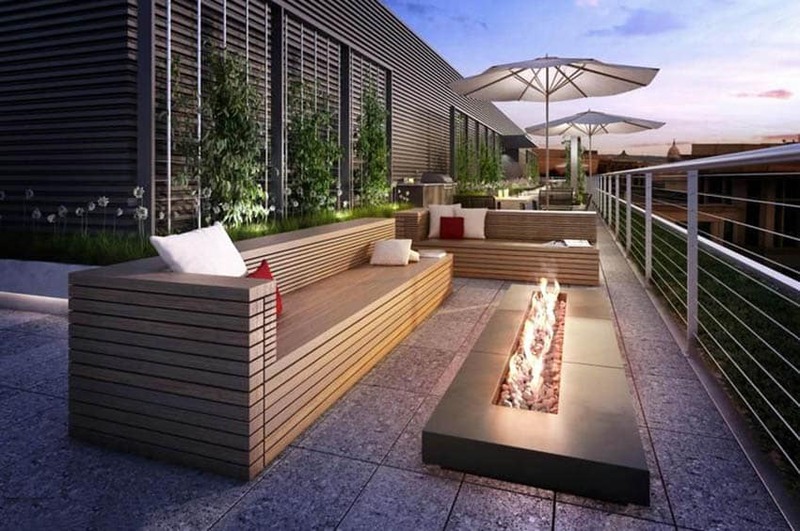 For modern patios, choose structures which are streamlined and have an emphasis on form. Open metal structures have an industrial look which works perfect for monochromatic scenes, and they also give climbing plants and flowers a place to grow. Create a main attraction. Add an interesting focal point to your modern patio by creating a main feature for your design such as a fireplace, a statement piece of sculpture or an accent chair. A towering stone fireplace, for example, directs the eyes towards the center of your patio and gives emphasis on height. 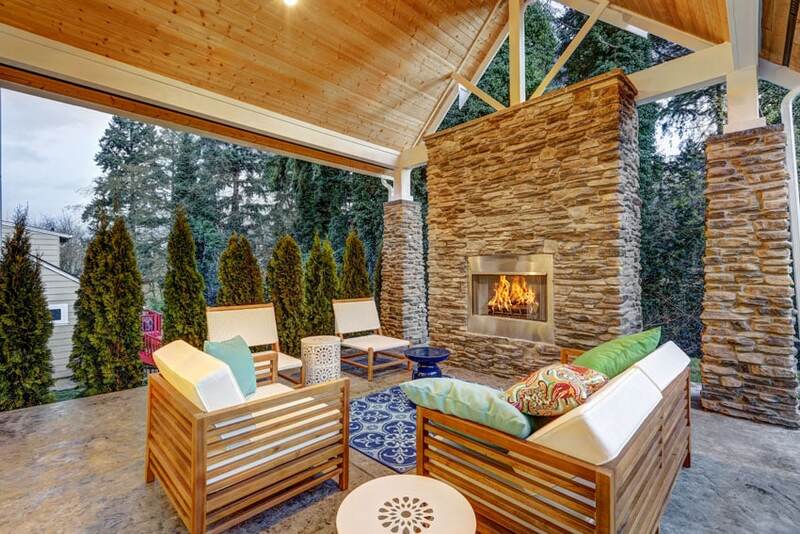 Outdoor fireplaces are an ideal place where family and friends can socialize and find warmth at night. Below we show you some more design inspirations which you can use to build your very own modern patio. 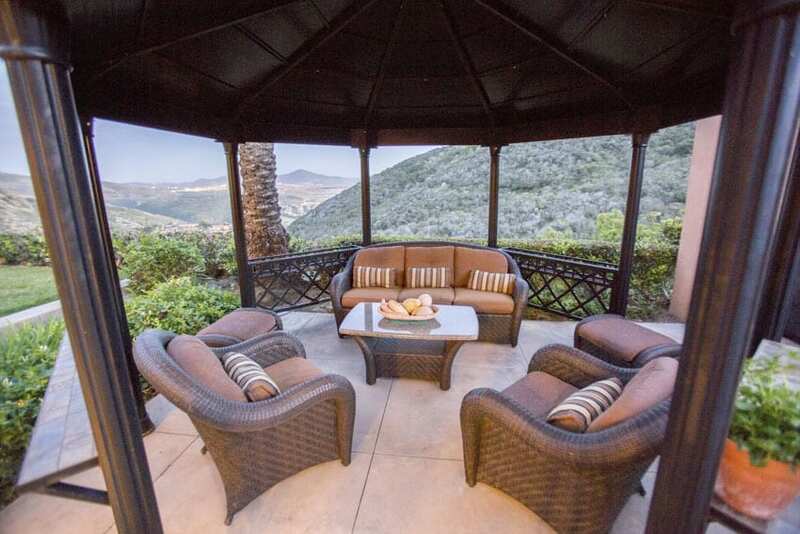 Luxurious and emanating class and sophistication, this modern patio comes with a contemporary styled gazebo. This expansive patio also offers a lot of activities in terms of its lay out. 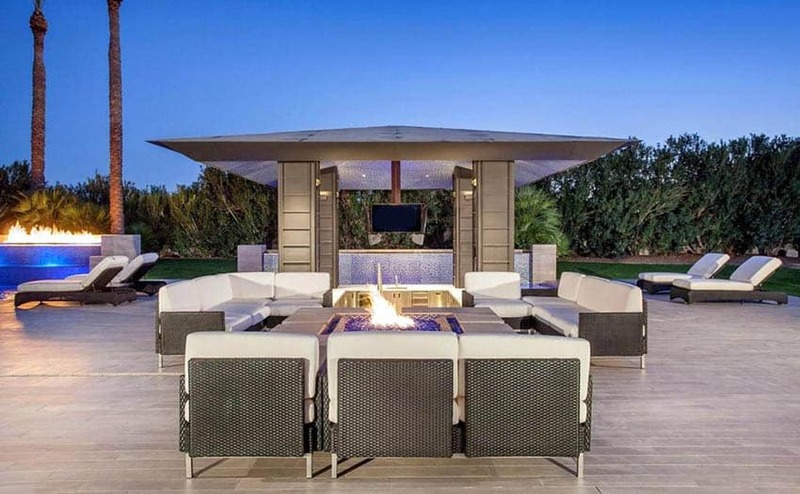 Homeowners can either enjoy watching a movie in front of the gazebo, or entertain a large group of guests while seated on elegant contemporary furniture surrounding a stone fire pit. Lounge chairs also provide for a place to rest after enjoying the pool. Beige color plank tiles give this outdoor living space a more expansive look and harmonizes well with the neutral color scheme. Found near the glass rails of this modern patio is a long rectangular stone fire pit which provides warmth during the cold weather. Serving functional aesthetics, it is a unique way to add decor to an outdoor space. Statement furniture pieces such as these beautifully crafted armchairs also create an interesting visual component while providing the users a place to indulge in outdoor living. This massive rooftop patio is also furnished with a six seater dining table which has a direct view of the swimming pool. Beige stone flooring coordinates with the color of the house’s exterior. 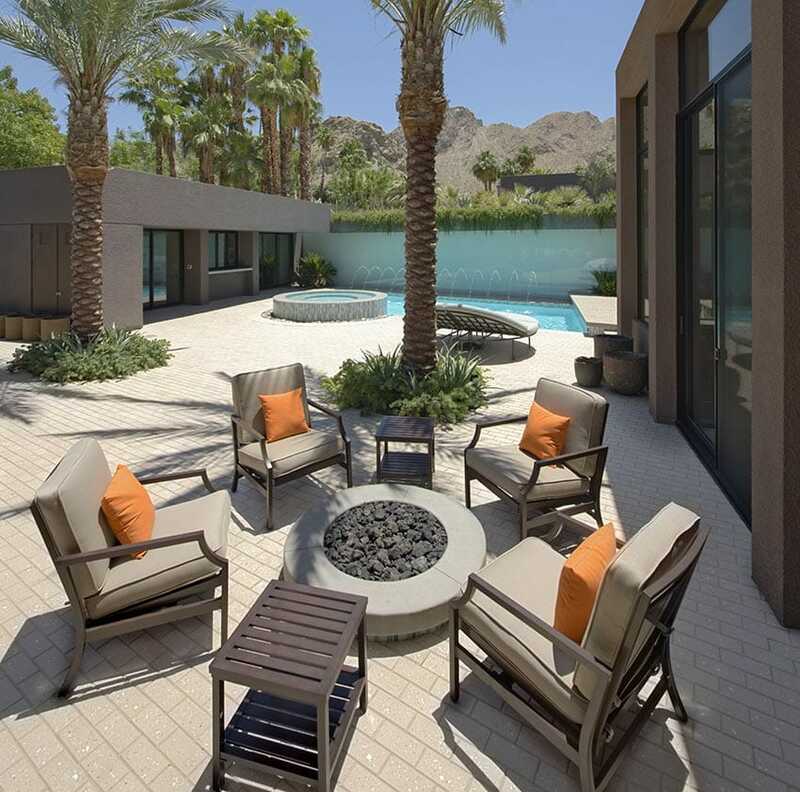 This modern patio design illustrates resort living at its finest. With a swimming pool and a stone hot tub, this area offers a place of serenity after a long tiring day at work. 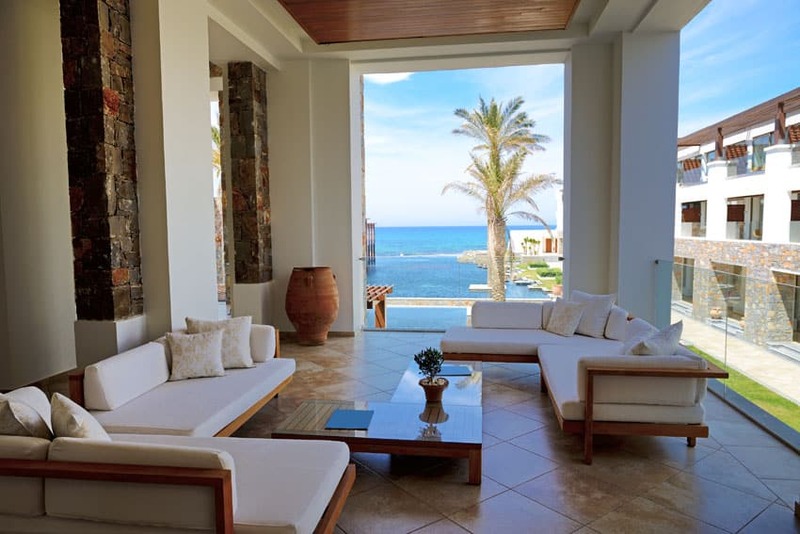 Furnished with contemporary outdoor furniture like woven rattan arm chairs, ottomans and reclining lounge chairs. Concrete pads and large sized gravel fillers are used as flooring materials which clearly define the different areas of this patio. In this picture, we can also see how the concept of the yard design follows the modern architectural style of the house. Simplicity is one of the keys in creating a beautiful modern patio. Minimal use of color and furnishings do not lack style but displays modern design sensibilities. This patio design makes use of white surfaces and a monochromatic color palette. The cool gray hue of cement flooring makes this space appear bigger. A built in fire pit works as the central design feature of this patio, allowing the homeowners to catch warmth for cold weathers. A matching built in bench provides extra seating for guests while the contemporary six seater dining table offers a place to enjoy a meal outdoors. 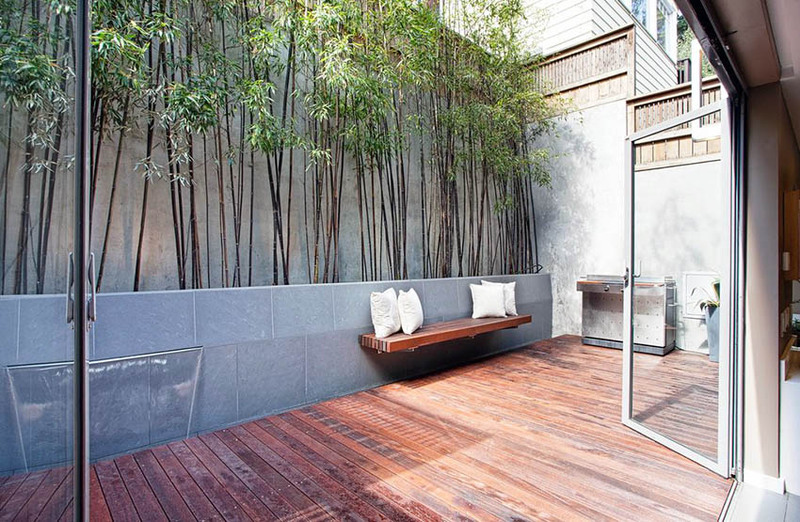 Sculpted plants add an organic touch, functioning as a natural accessory for this outdoor space. A streamlined wooden bench is the perfect match for the built in rectangular fire pit in this modern patio design. White and red throw pillows lessen the formality of the wooden furniture and contribute a tasteful accent color to the neutrality of the space. Stainless steel railings which border this balcony patio’s perimeter reflects the same horizontal lines used for the furniture and exterior design , tying up the components of this space into one cohesive look. For the flooring we see highly textured stone tiles which give depth to the space. Beautiful trailing vines which climb over the modern inspired trellises and blooming white flowers placed along concrete planters also highlights the form of this modern home. 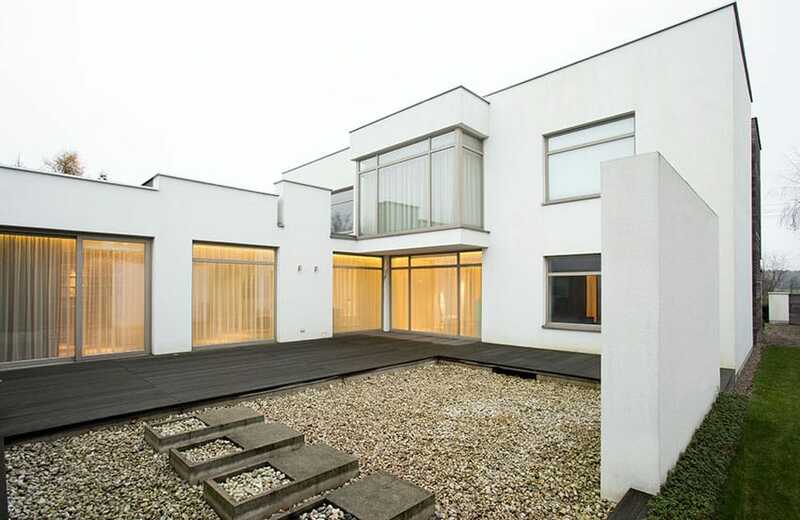 An all white design does not only work well for an interior space but for exterior design as well. Though some homeowners may find this hard to pull off, an all white color palette is highly suitable if you want to create a well composed uniform look. All white spaces also work as great canvasses, especially if used for exteriors because they allow natural elements to stand out. In this design we can see how the stunning view of the water emerges in this white modern patio. Clean lines and the bright crisp color give off a bright, airy ambiance, while glass railings create borders without obstructing the views. 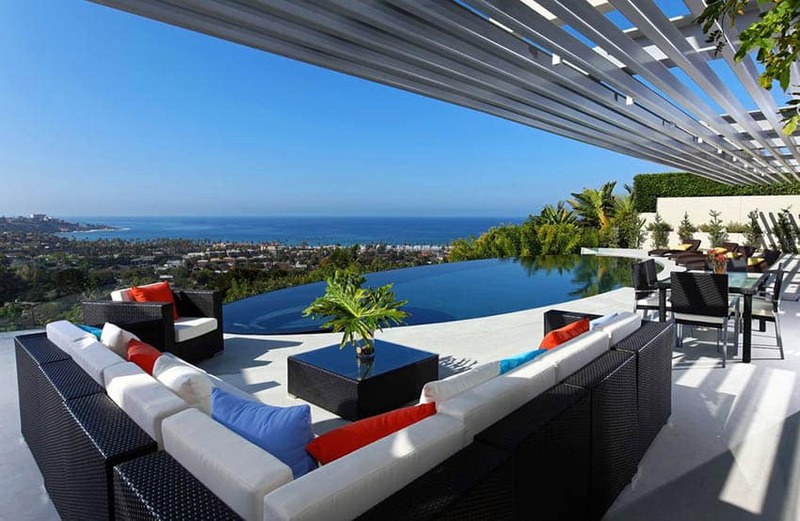 This modern patio has a picturesque view of the ocean and the adjacent infinity pool. White flooring gives off a crisp clean look and serves as a versatile background for the classy selection of furnishings. Black outdoor furniture with white loose cushions are accessorized with bright red and blue accents pillows which lend a lively burst of colors. While the matching dining table for six and brown outdoor lounge chairs are perfectly coordinated to display a unified design aesthetics. A white pergola provides partial shade and acts as an additional decorative element. Sculpted hedges and flourishing greens instantly soften the contemporary contours of this space. Talk about the perfect spot to sip some coffee while enjoy the breathtaking view of towering skyscrapers or the ideal relaxation corner to enjoy some personal time while reading a book after a long tiring day at work. Set at the corner of this modern rooftop patio lies a single contemporary wooden lounge chair with white cushions perfect for reclining. It is also accompanied by a small side table to hold refreshments or small knick knacks. This modern patio has a unique patterned flooring composed of varying sizes of rectangular shaped outdoor tiles which is mixed with large sized gravel. We can also see how the small lounge area is delineated form the rest of the space by using grass as ground cover. 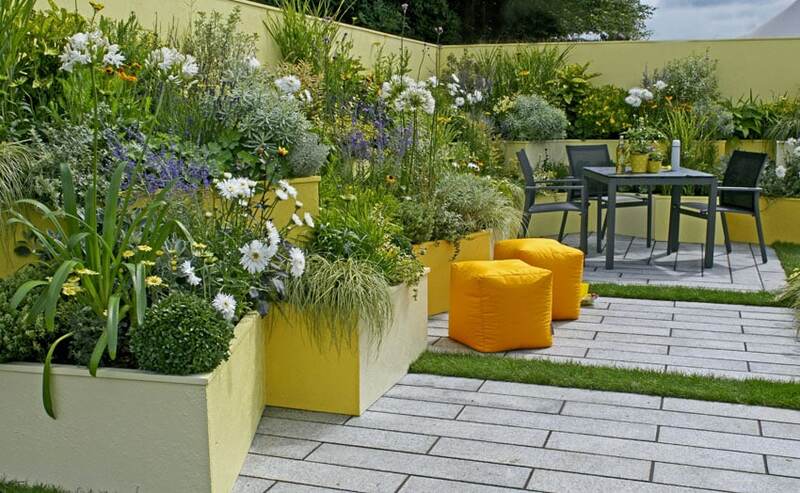 Warm, sunny and cheery – this modern patio plays with varying hues of pale yellow and bright Tuscany yellow. Built-in bi level concrete planters which are filled with verdant plants and lush blooms adorn the perimeter of this space, lending a charming organic feel to this outdoor dining space. This area is also furnished with a small three seater dining set, ideal for enjoying meals and eating outside of the home. Yellow ottomans function not only as additional seating but as bright accents for the monochromatic scheme of this modern patio. Enjoy cold nights huddling around a stone fire pit while sharing stories and delighting into the calming water of the swimming pool. 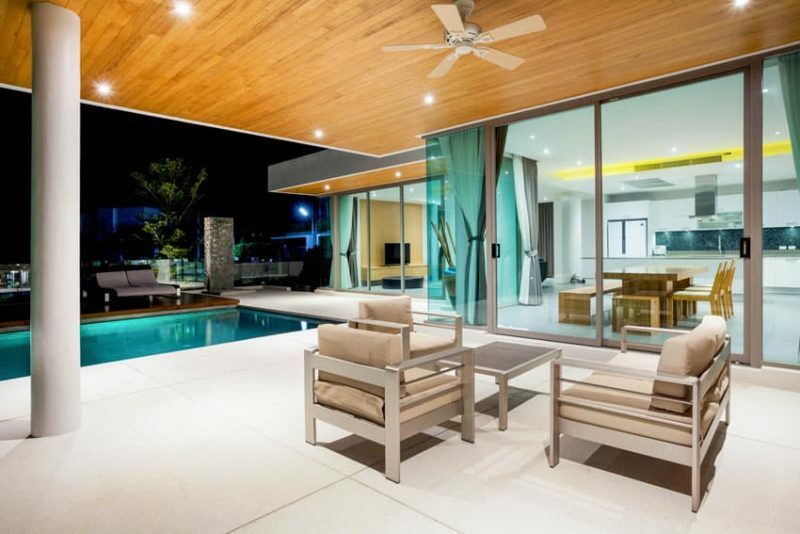 This modern patio extends to the pool and has an expansive floor space which allows the users enjoying the full view of the backyard of this modern home. Modern metal furniture with sand colored loose cushions complement the overall color scheme of the house’s exterior producing a well balanced harmonious look. Interlocking brick flooring coincide with the formality of the space but also bring a subtle variation in texture and pattern. This modern patio design has the ambiance of a contemporary Mediterranean oasis. From the indoor palm trees placed over a bed of white pebble stones, to the cool bluish green upholstery of rustic Mediterranean inspired metal chairs, this outdoor living area is the perfect place to relax and enjoy a breathe of fresh air. A stone accent wall adds an interesting visual element to this modern patio and , at the same time, it brings a subtle contrast of texture to the smooth matte floor tiles. Three steps of stairs direct the user to the main house where a contemporary wooden dining set greets you with a warm and inviting feel. Verdant hedge walls cover the perimeter of this modern garden patio. With only very minimal furniture and furnishings used, a single piece of wooden bench serves as the main seating area for this outdoor relaxation corner. A modern streamlined stone fireplace serves as the main focal point with its warm rust color and towering height. Gray outdoor ceramic tiles arranged in a uniform pattern complete the overall minimalist design of this space. The picture above showcases art in the form of patio design. This round modern patio deviates from the conventional rectangular layout and living room set up. 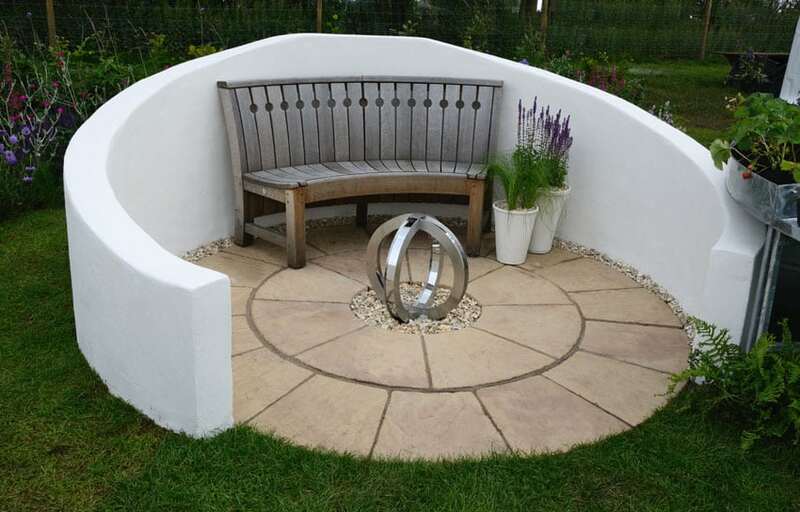 Following a more graceful form, it makes use of a semi circle white concrete wall and a round flagstone flooring with pea gravel fillers and grass ground covers. Its minimalist set up is composed of a single bent wooden bench with matching circular motifs in the back rest and two pieces of white resin planters with a splash of purple flowers. An eye catching metal sculpture works as the centerpiece, bringing eyes towards this interesting work of art. This luxurious modern balcony patio evokes a clean, sleek, airy feel with the use of a neutral monochromatic palette. Sophisticated contemporary wooden sectional sofas with white cushions serve as seating for entertaining small to large groups of people, or for lounging and enjoying some rest and relaxation. A matching wooden L shaped coffee table is placed at the center, giving room for a small indoor plant center piece. Decorative stones pillars add an interesting visual component and brings a warm accent color to this space. This modern patio is also bordered with glass railings – a good way to enclose a space without obstructing the surrounding refreshing view of the ocean. Concrete is considered to be one of the most perfect finishing touches for a contemporary patio. Although this material is traditional, it is versatile in terms of application and decoration. Some may consider it to be lacking in character because of its plain surface. Though it may not be the most attractive among all finishing materials, concrete offers endless possibilities in terms of design as it can be modified into a variety of curved forms, geometric shapes and sizes. In addition to that, it can be finished with a wide array of colors. Concrete is a popular choice for modern patio flooring because it is functional and durable.It can survive the everyday wear tear of exposure to high traffic and harsh outdoor elements like extreme heat, rain or snow. For homeowners with a limited budget, this material is a practical cost effective solution and is fairly less inexpensive compared to tiles, flagstones or pavers. It is readily available in any local home improvement store. In terms of installation, it is easy and quick to lay and can be a weekend DIY project. It is also non slip, making it an appropriate flooring material for poolside patios. However, there can be a few drawbacks to the use of concrete patio flooring. Discoloration and surface cracks can become visible after some time. To avoid the presence of these possible unsightly cracks, make sure to use the right type of concrete mix and lay it with care. Concrete is also an ideal complement to modern patios because concrete flooring works well for seamless transitions. Its smooth, clean surface meets the simplicity and formality of minimalist styles. A simple concrete slab patio is perfect if you want to achieve a modern industrial feel for your outdoor living space. Textures may be added if you want to enhance its looks, while if you want to obtain some variation in texture, it can be mixed with other materials and finishes like stainless steel or wood. There are also several types of concrete flooring materials which you can choose from to build your modern concrete patio. Each displays a distinct texture which gives different characters to your outdoor living space. These types are: the concrete slab or poured concrete, stained concrete, concrete pavers and stamped concrete. Poured concrete follows any form you desire and is ideal if you want a highly modified or customized patio flooring. Stained concrete is simply new concrete that is added with colors. These colors may be added by mixing a pigment to the cement before pouring or by spreading dye over a slab surface. Stamped concrete, on the other hand, is freshly poured concrete that is stamped with a pattern through the use of open or close molds. While concrete pavers are pre cut pieces of concrete used for exterior flooring. Among the four types, concrete pavers are considered to be the mainstay of patio building. 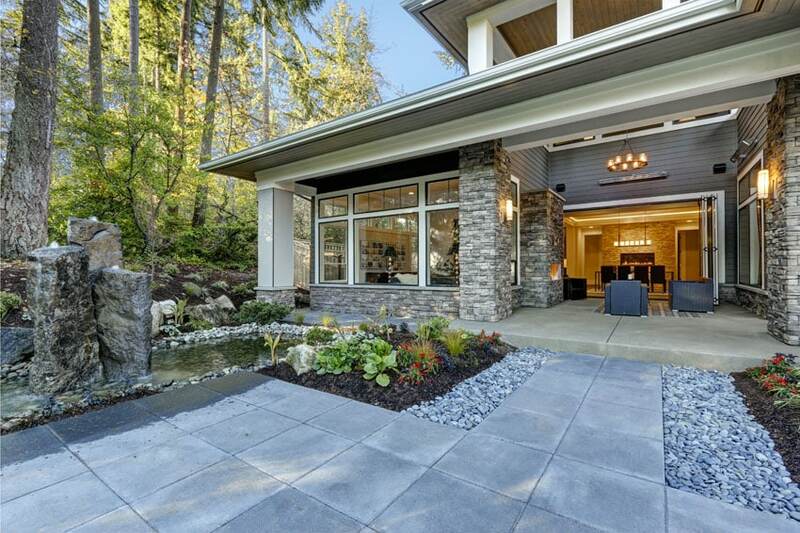 This patio design fuses the elegance of modern style with a hint of rustic country flair. 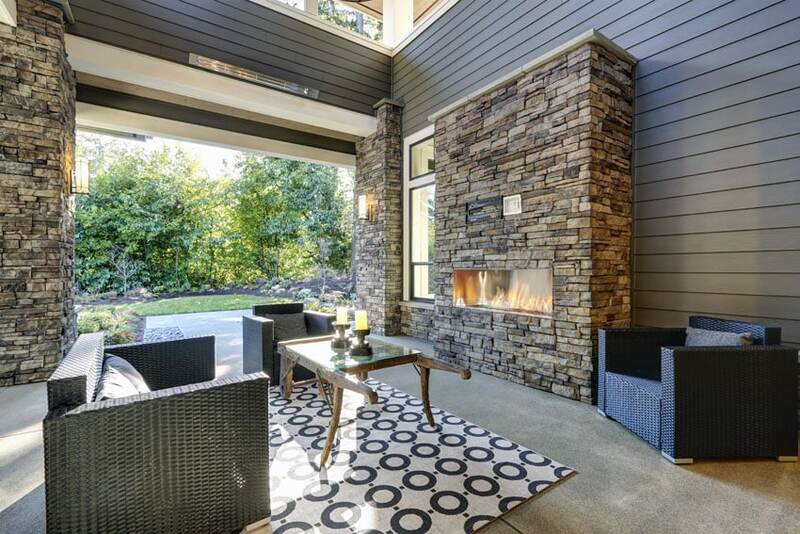 A magnificent contemporary stacked stone fireplace towers along the wall of this modern patio, serving as a focus of attention for this beautiful outdoor living area. Black rattan armchairs provide a strong element of color, while its clean design complement the streamlined horizontal wall panels. A wooden center table with rustic centerpieces bring a touch of country charm, as it matches the decorative stone accents in the structural components of this area. The concrete flooring makes the area appear more expansive while its gray color ties the whole color palette together. This concrete raised patio extends this house’s living area to the outdoors. Two black woven rattan armchairs are set up on an elevated concrete flooring and are set against a background of large glass sliding doors. In this design we see how the modern style is depicted through the dominant presence of clean horizontal and vertical lines. This is reflected through the use of an accent wall of horizontal wood strips which match the frames of the glazing. The encompassing grass cover softens the structural form of this outdoor living space. This modern patio leads to the expansive outdoor living area of the main house and gives a full view of the elegant indoor dining area. A man made pond serves as an additional feature for this space while the surrounding plants and flowers introduce colors and textures, softens the strong architectural elements of the house’s exterior and naturally complement decorative stone columns and walls. The combination of gravel and concrete tile flooring gives variation in texture and create a visually interesting design component, while its gray hues harmoniously blend with the neutral color scheme of the house. Reflecting an inspiration from Spanish style architecture, this patio design is a fusion of traditional style and modern flair. Stucco walls and clay roof tiles conform with the historic architectural style while elegant contemporary furniture are geared towards a more current vibe. The inner courtyard of this stunning home is filled with flourishing plants which bring a natural coziness to this area. A wooden pergola adjoins two different structures and serves as the roof for the outdoor living space. 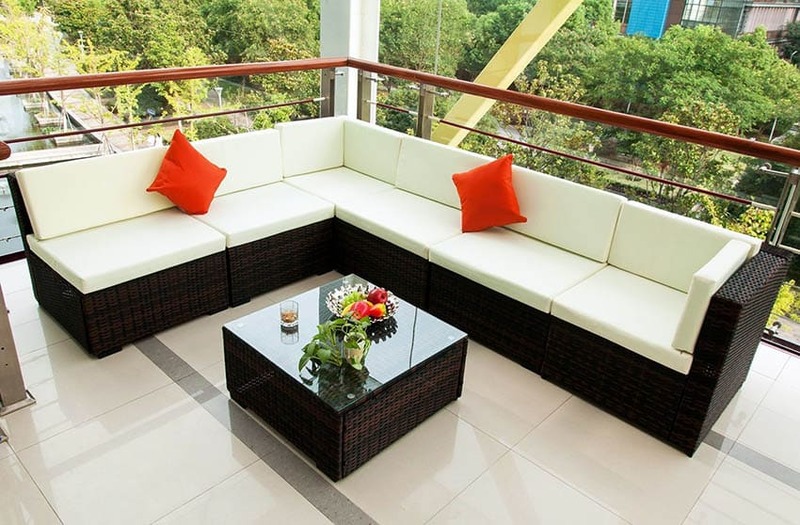 Contemporary outdoor furniture made of woven rattan and beige loose cushions serve as the seating area, which enables the homeowners to entertain a small group of friends while enjoying the full view of the home. 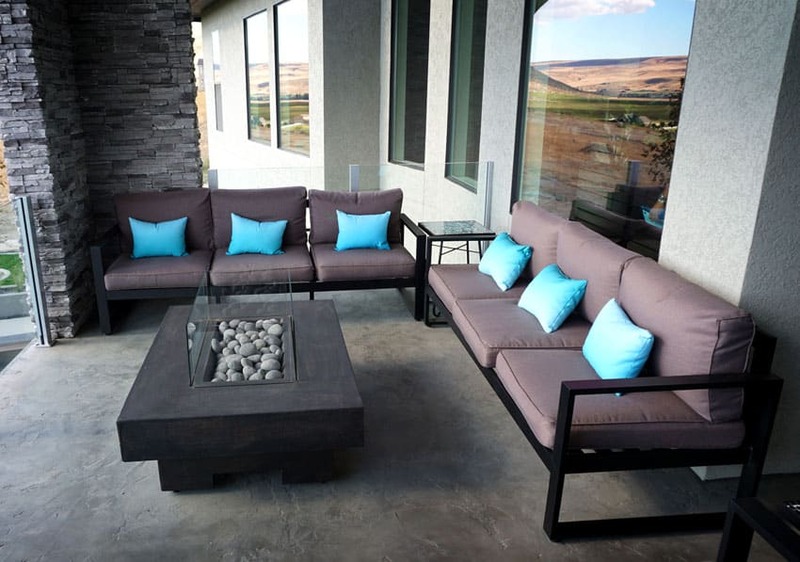 The picture above shows another example of a covered patio with a fire pit, however this design gives a different approach – with three seater sofas placed around a modern stone fire pit that is enclosed by glass and filled with white river stones. 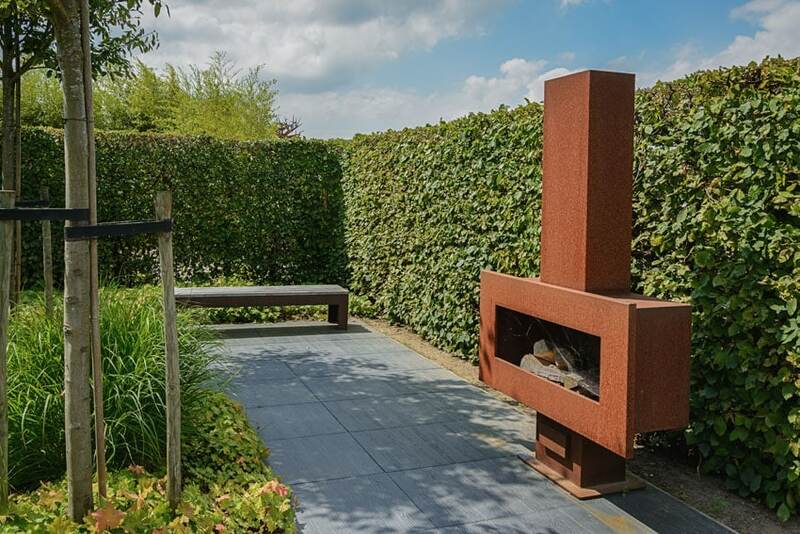 The fire pit also acts as an interesting central feature of design as it looks like a piece of art. Turquoise blue accent pillows add a fresh splash of color. Textured concrete flooring give character to the space and display a quiet strength that does not overwhelm the overall look of this space. Situated in a garden which is encompassed by the view of the magnificent hillside, this contemporary patio provides the homeowners a perfect opportunity to enjoy the outdoor living. A complete living room set up composed of woven furniture pieces with a matching center table are housed under a metal gazebo roof with half lattice wall panels. The brown earthy shades of this modern patio’s color palette are a perfect complement to the refreshing green color of plants and nature. Together, they create a naturally cozy environment which evokes a warm and welcoming feel. Stacked sand colored decorative natural stones adorn the facade of this modern patio’s fire place. A vaulted wooden ceiling takes advantage of the height and gives the area a more effective flow of ventilation. The warm shady tones of the decorative stone, the crisp clean color of white fabric for the cushions, the conservative look of contemporary wooden armchairs, the bright bursts of colors from quirky patterned accent pillows, the interesting pattern of the printed area rug, the popping blue color of the center table, the simulated veiny marble appearance of concrete and the refreshing color of flouring plants flooring –these all play with a high variation of color and textures, resulting to additional depth and dimension to the overall look of the space. A patio with an outdoor kitchen is perfect for homeowners who love to cook and find delight in enjoying a sumptuous meal with friends or family in the backyard. This is the ideal weekend relaxation area where you can grill out in your very own yard while enjoying a cooling afternoon dip in the pool. This modern patio design makes use of a multilevel flooring which defines the kitchen and dining area from the rest of the space. Natural stones are used for the kitchen counter as this type of material can withstand the heat generated from cooking. Ultra modern patio furniture offers stylish lines that will impress friends and family alike. Many pieces are constructed from a steel or aluminum frame with synthetic rattan made from resin for longer lasting outdoor use. Cushions are often made of polyester which are easy to remove and clean. 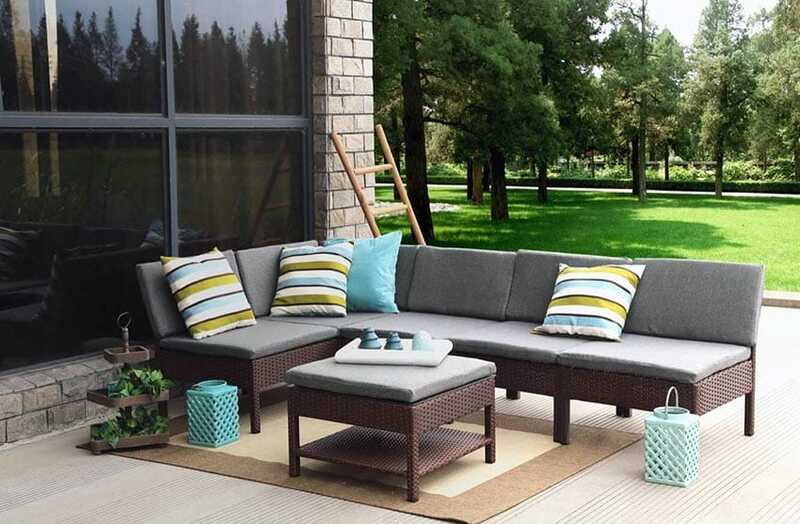 This sectional sofa set comes with cushions and coffee table to put the final touches to your modern patio space. 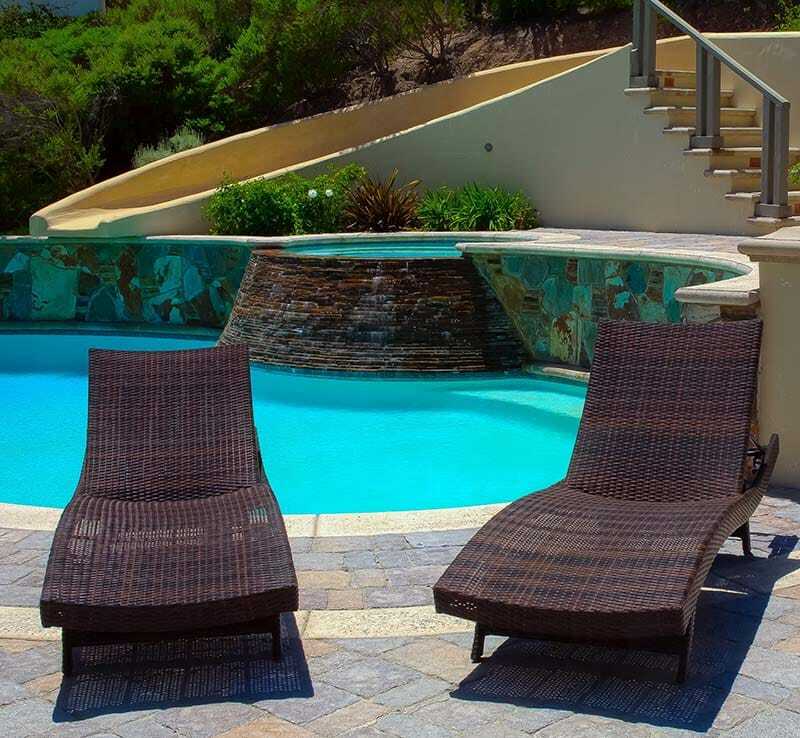 A chaise lounge is the perfect compliment to a modern poolside patio. These chairs are constructed of polyethylene wicker making them able to hold up to outdoor conditions and are adjustable in 4 directions. The chairs lay flat making them ideal for those who want to sunbathe. This modern furniture sofa set could be positioned on a patio or under a gazebo or pergola to complete your outdoor living design. Made from woven resin wicker material the seating can hold up to adverse weather conditions. This size is perfect for a family of four to enjoy year round. Modern patio decks are provide an ideal opportunity to enjoy natural views and surrounding landscapes. One integral part of modern patio deck design is the decking or flooring material. Typically, modern patio decks have hardwood floors. Commonly following a horizontal or vertical pattern, hardwood planks or decking materials conform with the streamlined aesthetics of a contemporary home or a minimalist patio. Keeping the floor pattern simple naturally leads the eyes to a main attraction such as a fireplace or a water feature. The diverse types of wood which one can explore each display a different aesthetics that exude in natural coziness. Found inside the courtyard of this modern home is a small patio with a wooden floor and sleek rattan outdoor furniture. This design tastefully combines rich and neutral tones, creating a strong yet formal contrast in color. Finely sculpted grass and minimal amount of plants conform with the minimalism of the space. 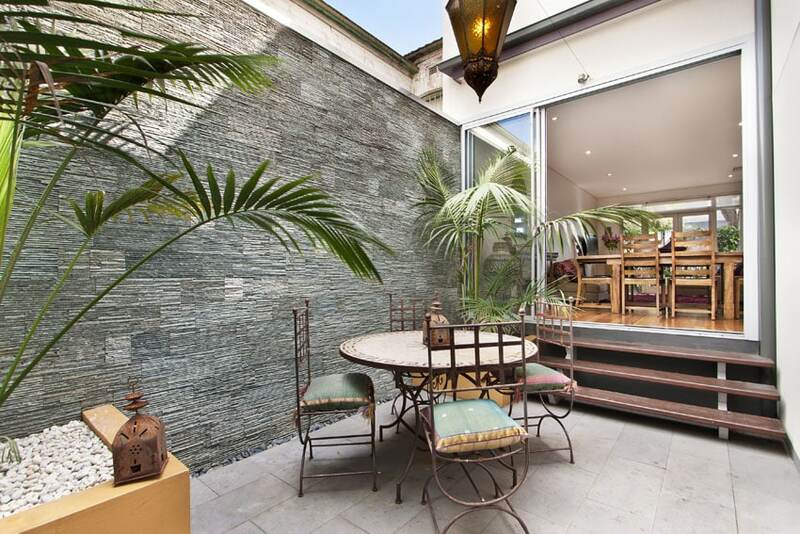 This patio also has skylight ceiling which takes advantage of natural lighting. A uniquely designed open partition using natural wood trunks provide a distinctive visual element and gives the space natural ventilation. 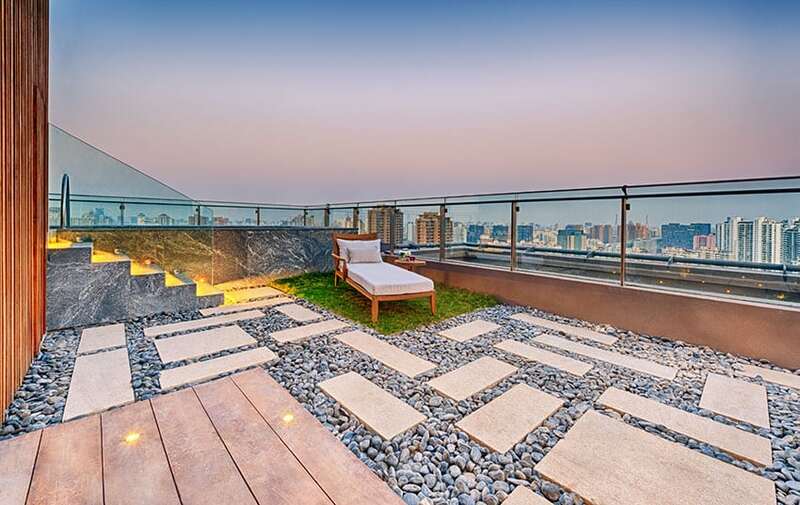 This modern deck provides a relaxing place to take in the serenity of the landscaped backyard with its Asian inspired rock garden and art wall. Modern patio ideas such as this evoke emotions while still maintaining harmony and a cohesive design. 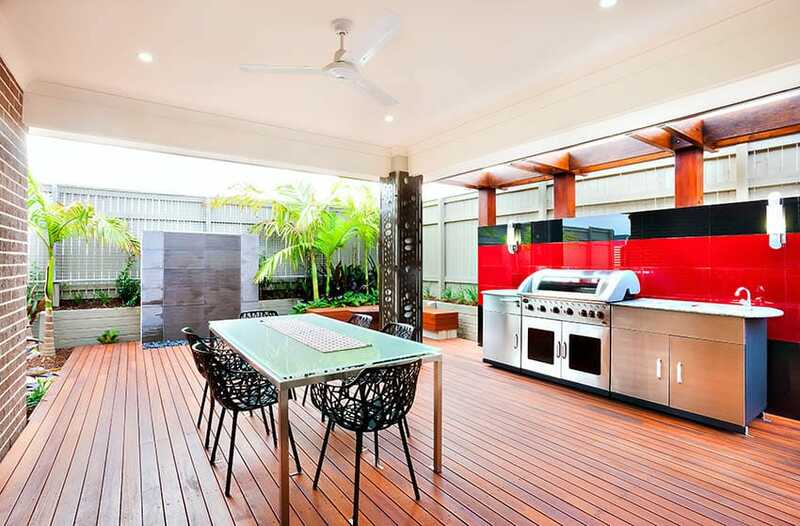 Black and red ceramic tiles add an intense accent color to this fun and lively modern patio design. The wooden plank flooring stands in contrast with the white flat ceiling, the brick wall and the glossy surface of the stainless steel kitchen counter. A water feature is also added to the stone rectangular fence planters. The dining area makes use of a modern glass table with metal legs and black accent chairs. This design is an interesting mix of materials and finishes, colors and eclectic design aesthetics. It shows a bit of playfulness in terms of modern patio ideas, but it doesn’t veer away from the simplicity of the modern style . This small backyard features a modern wood deck with bench and concrete retaining wall with a water feature fountain. Deviate away from the monotony of a minimalist design by combining different finishes with natural materials. 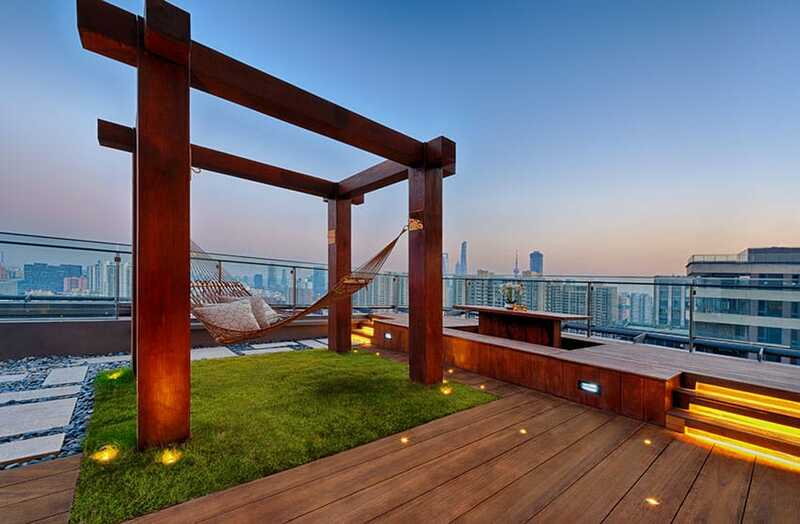 This rooftop patio makes use of natural wood deck flooring with warm ambient lights. A natural grass lawn breaks the uniformity of the design by providing an organic element to the space, while rectangular stone pavers and gravel fillers define the walkways. A simple wooden table and seating is uniquely incorporated into the raised platform over the side of the deck. This allows the users to take art in a meal while indulging in the view of the city. At the center is the main feature of this modern patio, which is the grand four poster structure which holds a hammock. Minimalist designs mostly rely on variations of textures to add depth and dimension to a space. A play on different finishes keep the place more interesting, just like the one shown above, wherein rough pea gravel ground cover is used to create contrast with the sleek design of wooden deck flooring. This modern patio design display clean lines, a neutral color palette and no furnishings. Unlike the previously shown modern patio ideas which are fully furnished with seating, this outdoor space is more of a continuation of an architectural composition.